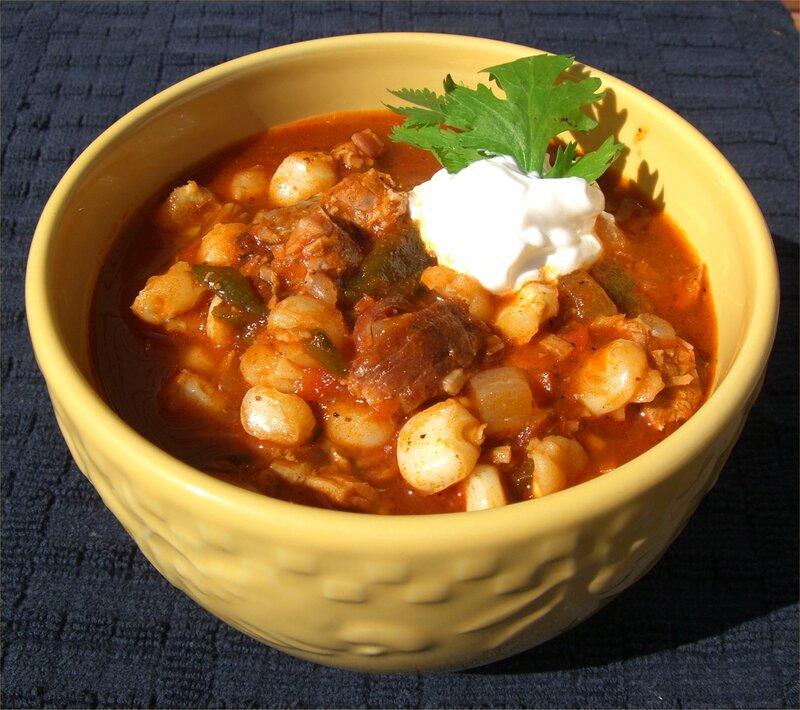 Posole (poe-SO-lay) is one of those Mexican dishes you may not have heard of. For me, it’s the unsung hero of stews. It is delicious and easy to make and should be in everyone’s recipe box. You really should try it sometime and see what all the fuss is about. C’mon…don’t be afraid to make a new friend. This is my go-to meal when The Complete Package smokes a rack of pork ribs and we have leftover meat. And on his behalf, let me state for the record that TCP smokes a mean rack of pork ribs! Anything leftover after rib night gets picked off the bones and frozen in air-tight containers for posole. It’s also the reason I keep a large can of hominy in my pantry at all times. I like to plan ahead like that. And I’m the queen of recycling just about everything, including pork. In a large saucepan over medium heat, cook the oil, onion and peppers until translucent. If you don’t like heat, leave the jalapenos out, but keep the poblano – it adds so much flavor. Next, add the garlic and stir for about 30-45 seconds or until you start to smell it. Add the drained hominy, tomato sauce, smoky pork, chicken stock and all the dry spices. Save the cilantro and sour cream for the end. Stir to combine all the ingredients, then put a lid on it and let it simmer for 30-45 minutes, stirring occasionally. Turn off the heat and allow the stew to sit for at least one hour. Trust me, it helps all the flavors come together. Don’t skip this part. After one hour, bring the posole back to a simmer to heat it back up. Add the fresh chopped cilantro and give it all a stir. Then spoon the posole into bowls, top with sour cream and go for it. You can serve this with warm flour tortillas or a crusty loaf of French bread. And if you don’t like this recipe, I’ll donate a can of hominy to my local food bank in your honor. That’s how good it is. Pinkie swear. I keep seeing kosher salt in recipes. Is it a lot different from regular salt, and if so, how so? Thanks for checking out the recipe. I’m no expert, but here’s what I know about kosher salt. Nutritionally, kosher and table salt are the same. The difference is in the texture. Table salt is refined into a smaller grain so it disolves more quickly and can fit through the holes in the top of your salt shaker. It works well in any recipe that calls for salt. Kosher salt is milled into larger flakes, which effects the taste and texture, as well as how most people use it. I use kosher salt a lot because I prefer the larger flakes, especially on hand cut french fries, on a steak or burger, or even in soups or stews because it will melt down eventually. I use table salt for things like baking (cakes, cookies, etc) where I want the salt to enhance the flavor but not be noticeable. If you haven’t tried it, buy a small box (it’s inexpensive) and try it on homemade french fries and you’ll see what I mean. Happy salting! You have to try it, especially if you have some smoked pork left over from a rack of ribs, etc. It’s so good, you’ll be running to the stove for a second bowl! How many servings does one batch make?